A big part of what we offer is that we have boots on the ground in China. Unless you’re willing to play Russian Roulette and hope you don’t get burned, the only way to safely import from China is to have someone there in your behalf who knows the business culture. Our partner companies know the right questions to ask (in the Chinese language, so there are no cultural or other communication barriers), can call the factories, meet with them, prequalify them, and determine whether they would be a good fit for your project. Then they negotiate prices, inspect the orders, and process the shipments so from start to finish everything is taken care of. We receive phone calls from American customers who’ve tried to do it on their own by emailing or even calling a supplier in China they found online, only to come up against a wall. Often what happens is they trade one or two emails with the Chinese supplier and then all communication stops. Or they get a quote, ask for a sample, and the Chinese side disappears. I’ve heard of Americans who tried to call but the phone was answered by a person who only spoke Chinese; game over. Sadly, I’ve also talked with customers who’ve sent money to China and got burned when the Chinese did their disappearing act. The risky part of this game is that if you don’t have someone there you don’t know if you’re talking to a factory, a trading company, or an individual in an apartment with a PC. It’s also difficult to judge whether they can really do the job from 7,000 miles away. The lion’s share of China’s industrial base is on China’s Eastern Seaboard. 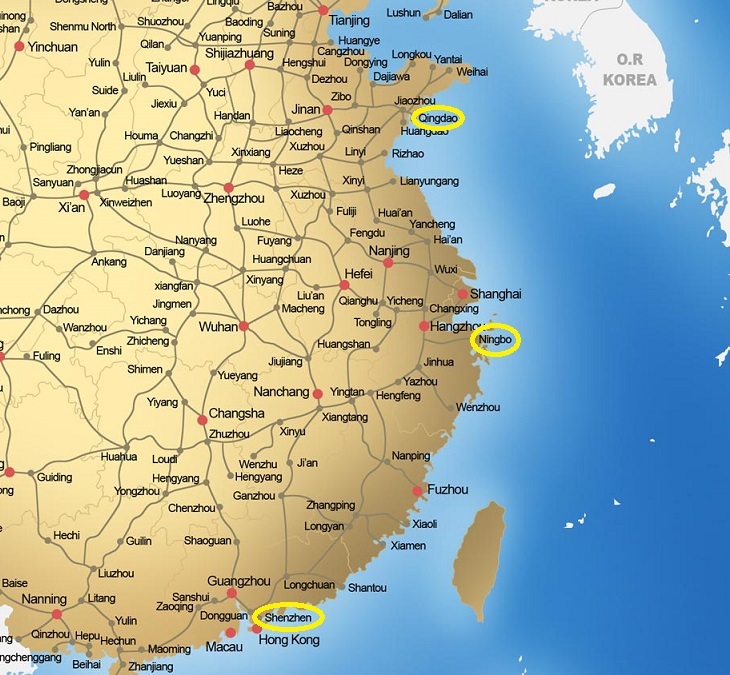 Our partner companies are located in Qingdao, which is on the Northeast just south of Beijing, Ningbo, on the outer rim of the east coast, not far from Shanghai, and Shenzhen in the southeast, which is just across the bay from Hong Kong. Shenzhen is the hot bed of electronics manufacturing; the iPhone is made there, as well as HP and Dell’s computers. We’ve sourced plastic injection molded parts and wood products from Shenzhen. We source plenty of machined parts, castings, forgings, sheet metal and other fabricated parts from Ningbo and Qingdao, and have sourced a number of textile products from Qingdao. The locations of our partner companies gives us – and you – perfect access points for sourcing products from manufacturing companies in all of China’s major industries.